The Thornapple Street News, April 16, 1932. CCHS 1989.27.01. The young reporters would not have been nearly as dedicated to the newspapers had there not been a strong element of fun involved. The children (and their parents) recognized the valuable life skills to be learned in producing a weekly newspaper. The content of the newspapers, however, reflect a child’s interests in games, sports, and outdoor exploration. Bridging the gap between formal and informal play, the newspapers served as a form of entertainment for the children in addition to facilitating their participation in social activities and events. "The Adventurers Club and a boy scout which helps them went down to two gold mines last week…The boys played indians and cowboys in the woods. They used a special hole for the main prison." The Thornapple Street News, November 21, 1931. CCHS 1989.27.01. Sports and other forms of structured play were a part of children's lives in both the 1930s and 1970s. 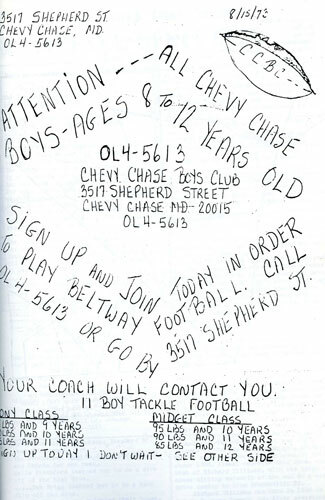 Echoing their parents' participation in social clubs and organizations, the young reporters explored with the Adventurers club, played football with the Chevy Chase Boys Club (beginning in 1972) and took swimming lessons at the Y.M.C.A. 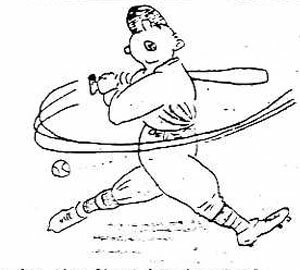 The newspapers shared scores, advertised new camps and clubs which were forming and cheered on Washington, DC's professional sports heroes. The Shepherd Street News, August 15, 1973. CCHS 1989.27.01. "The Chevy Chase Boys Club, Midget and Pony Teams, played their first games last week. The Pony team were outmanned 30 kids to 14..but they played hard considering. They were beat 26-0." The Shepherd Street News, September 23, 1972. CCHS 1989.27.01. "John Koon and Susanne Mitchell both passed their swimming tests at the Y.M.C.A." The Leland Street News, 1973 4th issue. CCHS 2010.1015.01. 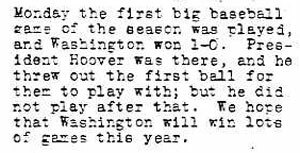 The start of the 1932 baseball season with the Washington Senators. The Thornapple Street News, April 16, 1932. CCHS 1989.27.01. Cheering on the home team. The Shepherd Street News, January 6, 1973. CCHS 1989.27.01. The pets of Chevy Chase gave children additional responsibilities in caring and protecting for other creatures, while also serving as loyal playmates and companions. The death of a pet was an often featured news story, giving public recognition to the cats, dogs, and fish that brought the children so much joy. "Frisky, Ann Bradley's flying squirrel…has a box for a bed. He sleeps all day on the window ledge because he likes it better than the box." The Thornapple Street News, January 21, 1933. CCHS 1989.27.01. "The Jones' cat, Cricket, is recuperating at home after a massive viral attack and a similarly weighty vet bill." The Leland Street Sunday News, February 2, 1975. CCHS 2010.1015.02. Pet Pig Dies: Mussolini died last week. Mussolini was an Abyssinian guinea pig. His owner was Helen Green of Quincy Street. The Thornapple Street News, December 21, 1935. CCHS 1989.27.01. The Thornapple Street News, April 9, 1932. CCHS 1989.27.01. The editors of The Shepherd Street News and The Leland Street Sunday News put their wit and humor to good use, featuring riddles, crosswords, word searchers, sayings and "Hints for Kids". "Hints for Kids: "Kids, when your parents have company you can do anything you want because they won't get mad in front of company." "Kids, when you want to sleep over at a friend’s, do something nice for your mom or dad, like rake the yard or help your mom set the table. You'd be surprised how often they say yes after you've done something nice." "Riddle of the Week: What is yellow and dangerous? Answer: Shark-infested custard." The Leland Street Sunday News, 1973, 4th issue. CCHS 2010.1015.01. The children in Chevy Chase also had the imagination to create their own fun. "Some of the kids on Shepherd St. are going to have a gymnastic show at the red house lawn. Across the street from the Flints…"
The Shepherd Street News, September 9, 1972. CCHS 1989.27.01. "On Labor Day, the Leland Street Summer Theatre gave its third and best performance yet, Rumpelstiltskin. Clad in bright colorful costumes the actors, who included Maura Lee as the princess, Scot Klingenmaier as her father, Danny Klaidman as the princess, Andrew Patch as the King, Claudia Kolker as the Title role, Penny Wineburger as a lady in waiting, as well as people of the court, were at their best." The Leland Street Sunday News, September 14, 1975. CCHS 2010.1015.02. Games and hobbies gave children the chance to interact and participate in their interests, ranging from dodge ball to music. Boys and girls enjoyed many of the same activities, setting a foundation for working together to publish the newspapers. "Over at the Maryland School, the children are playing dodge ball. The boys are winning nearly every game because they have practices much more than the girls." 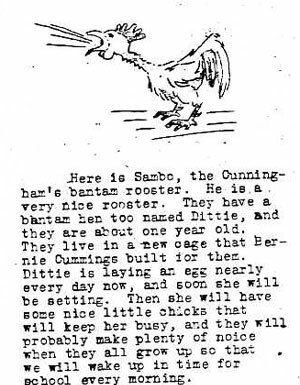 The Thornapple Street News, November 14, 1931. CCHS 1989.27.01. "Hobbies…We decided to do a special report on hobbies of Leland Street kids…Lees: Brian collects stamps...Megan plays the piano, Maura's hobbies are cooking and playing the piano. Michael plays ice hockey. Kolkers: Adam Kolker plays soccer. Jason Kolker and Andrew and Teddy Patch have a shared collection of baseball cards...Browns...Steven, who's at the University of Chicago, collects political items and has put together a political scrapbook..Littles: Ann and Carolyn collect records...."
The Leland Street Sunday News, December 12, 1976. CCHS 2010.1015.03. "Over at school a lot of the boys were fighting and a teacher came out and said that they could not fight because one of the boys was hurt badly last week. so the boys are playing tag and tripping each other instead." The Thornapple Street News, October 31, 1931. CCHS 1989.27.01. Participating in a range of activities that were both fun and instructive made working on the neighborhood newspaper a natural extension of playtime for the young reporters. But the young reporters still had a lot to learn if the papers were to be successful. In the next section, "Tricks of the Trade", learn more about the tricks of the journalism trade and how the children produced their weekly editions. Click Next for "Tricks of the Trade"